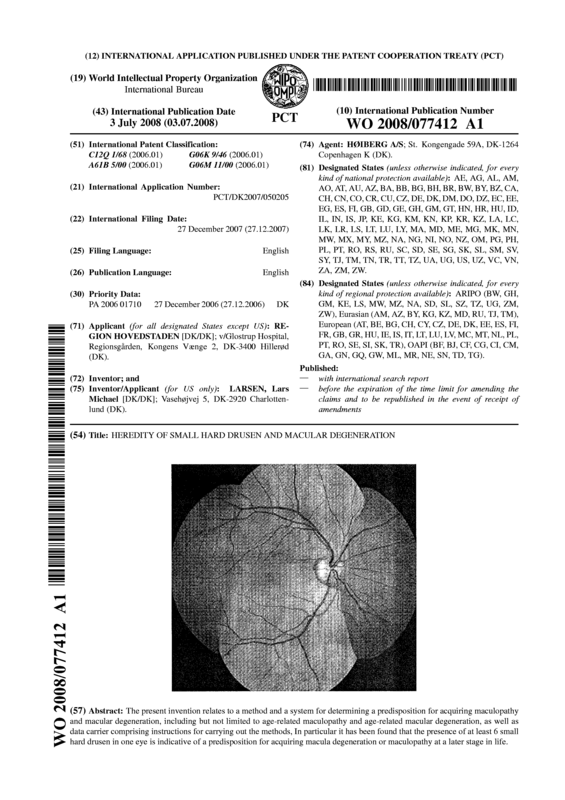 The present invention relates to a method and a system for determining a predisposition for acquiring maculopathy and macular degeneration, including but not limited to age-related maculopathy and age-related macular degeneration, as well as data carrier comprising instructions for carrying out the methods, In particular it has been found that the presence of at least 6 small hard drusen in one eye is indicative of a predisposition for acquiring macula degeneration or maculopathy at a later stage in life. 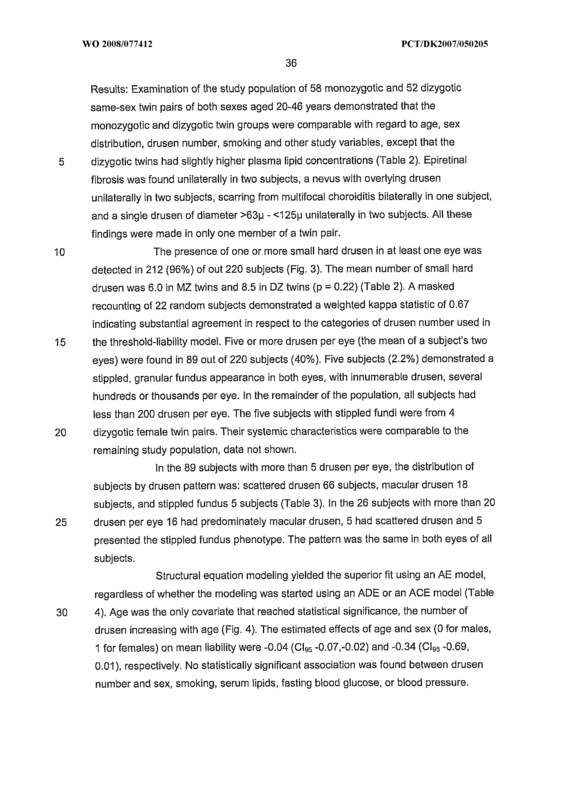 wherein a number of small hard drusen above 6 in at least one eye, and/or a position of small hard drusen within a predetermined distance to the macula is indicative of a predisposition for acquiring macula degeneration at a later stage in life. 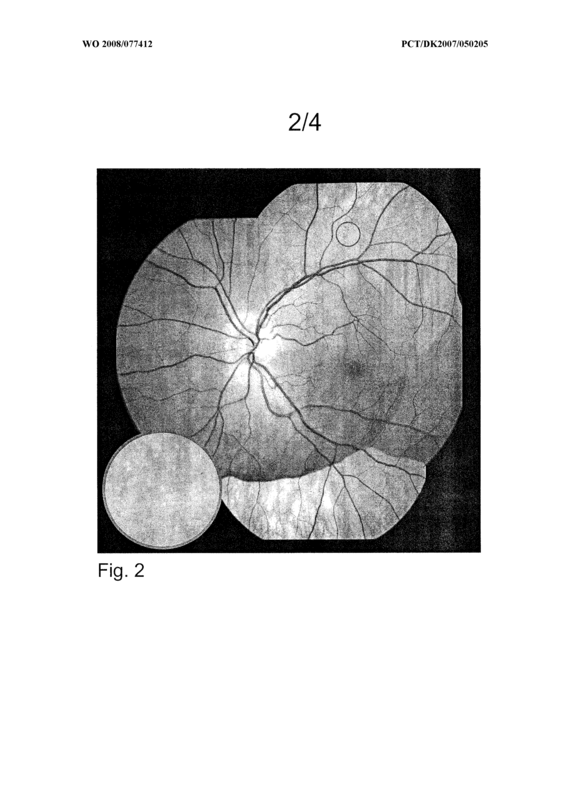 The method according to claim 1 or 2, wherein the predetermined distance to macula corresponds to the distance between macula and the optic nerve or iess, such as a distance corresponding to Vz the distance between macula and the optic nerve head or less, such as a distance corresponding to 1/4 the distance between macula and the optic nerve head or less. 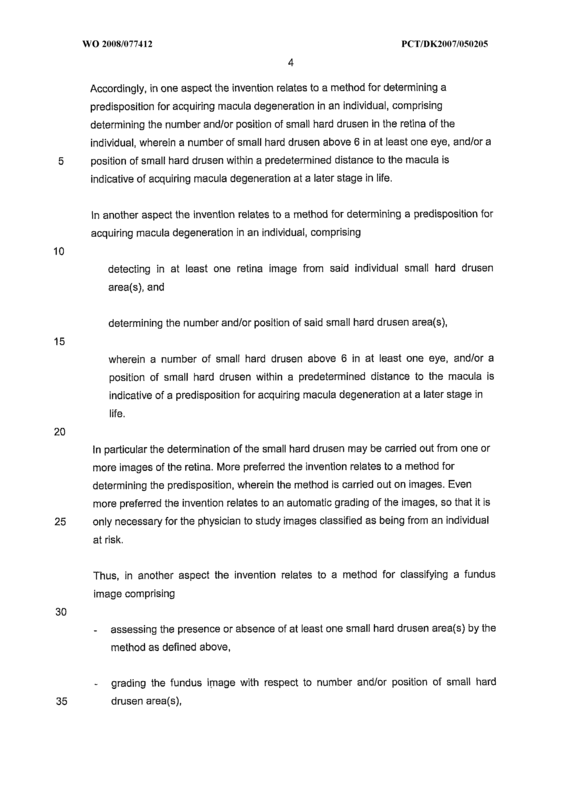 The method according to any of the preceding claims, wherein a number of at least 8 smal! 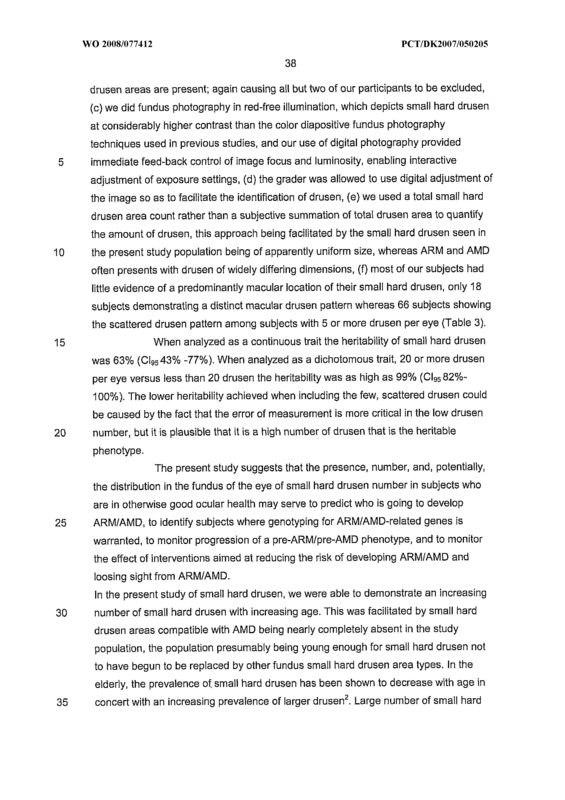 hard drusen is indicative of a predisposition for acquiring macula degeneration at a later stage in life. 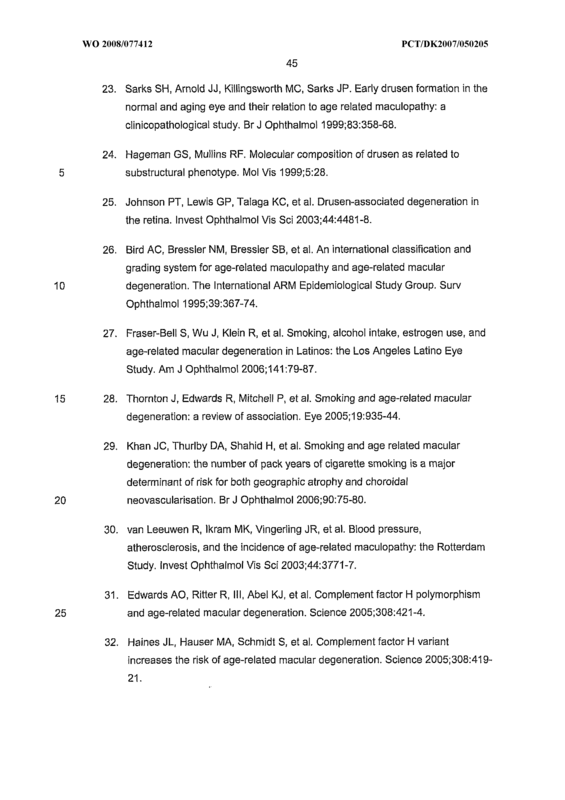 The method according to any of the preceding claims, wherein the individual is between 20 and 46 years old. 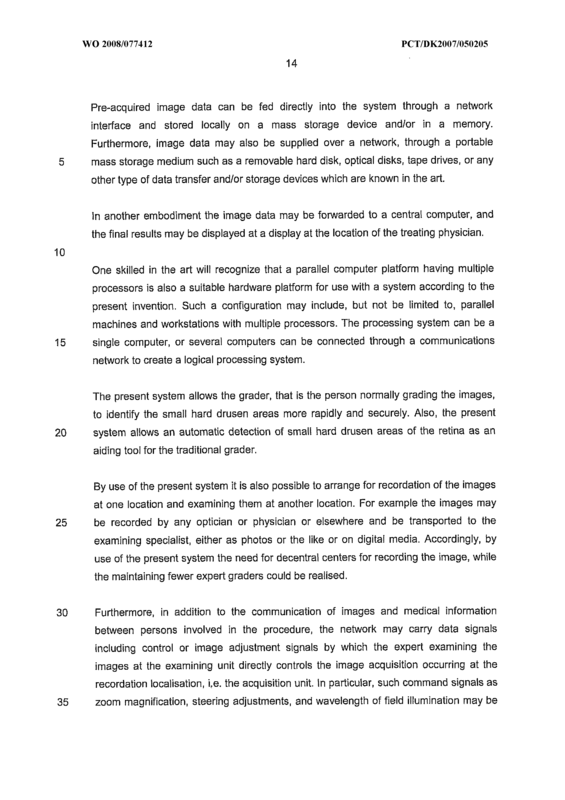 The method according to any of the preceding claims, wherein the image is presented on a medium selected from dias, paper photos or digital photos. 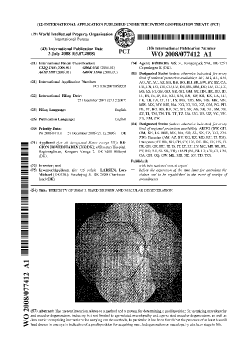 The method according to any of the preceding claims, wherein the image is a colour image. 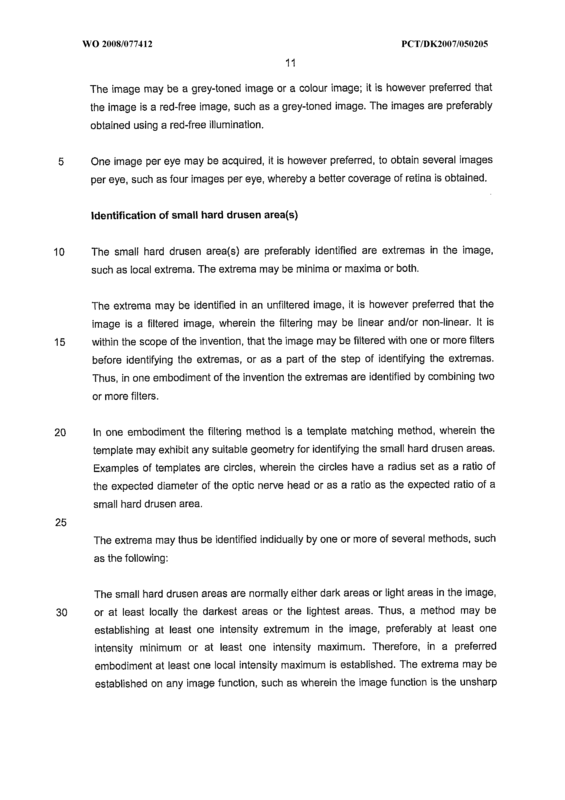 The method according to any of the preceding claims, wherein the small hard drusen are identified as extrema of the image. 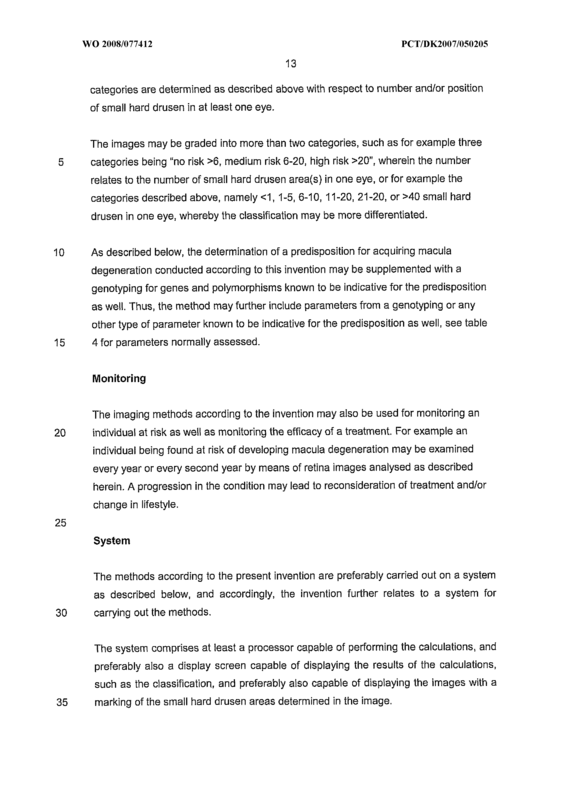 The method according to any of the preceding claims, wherein the extrema are identified by filtering the image. 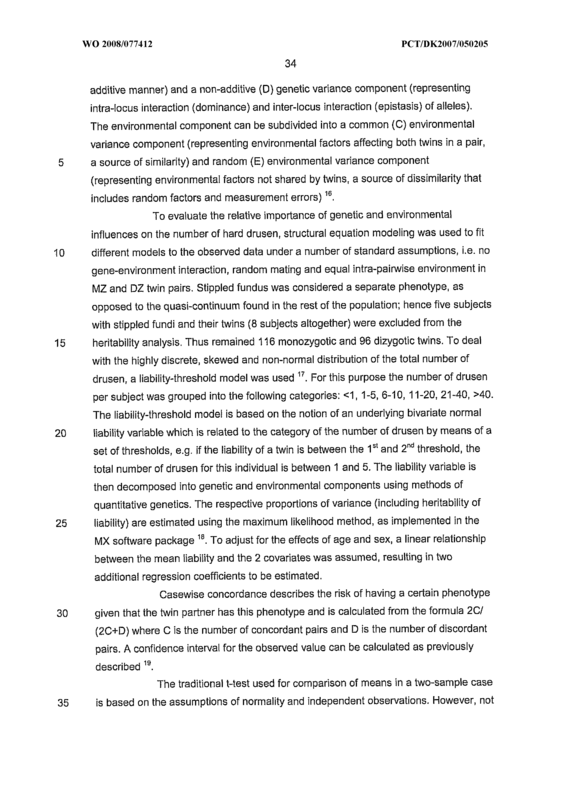 The method according to any of the preceding claims, wherein the extrema are corrected with respect to the background variation. 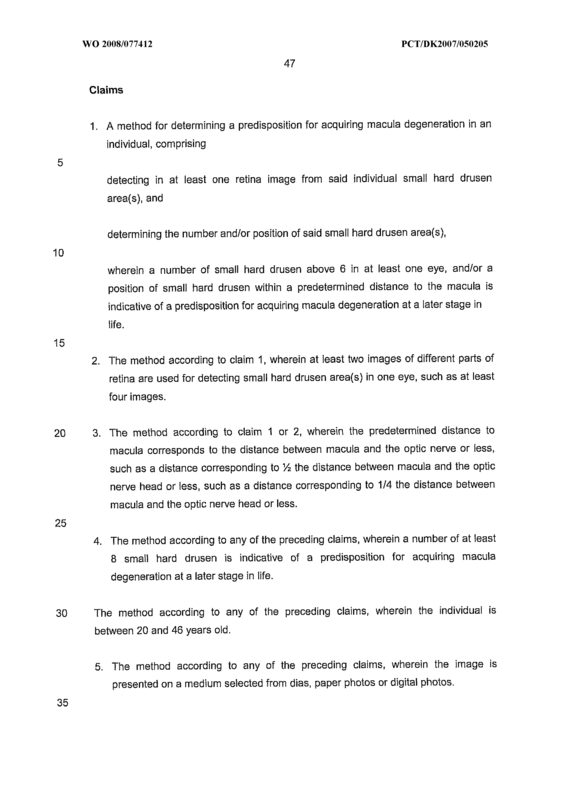 The method according to any of the preceding claims, further comprising detection of a region comprising the optic nerve head. 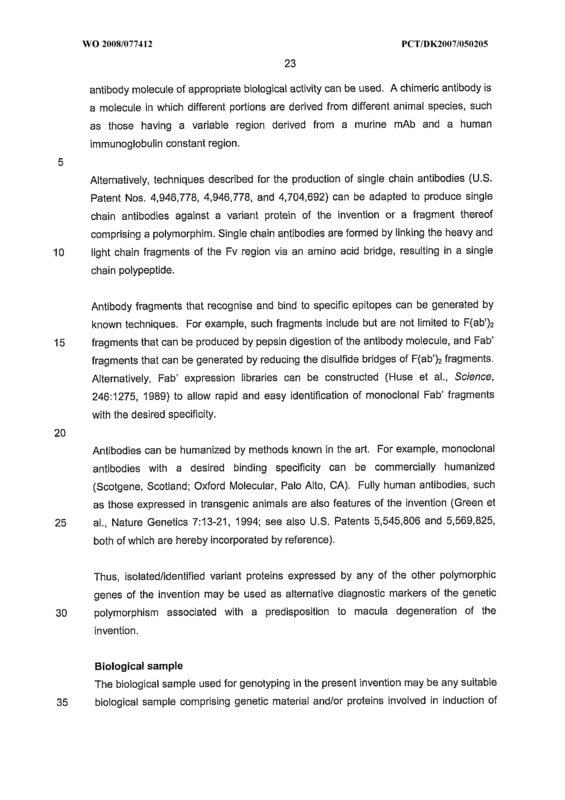 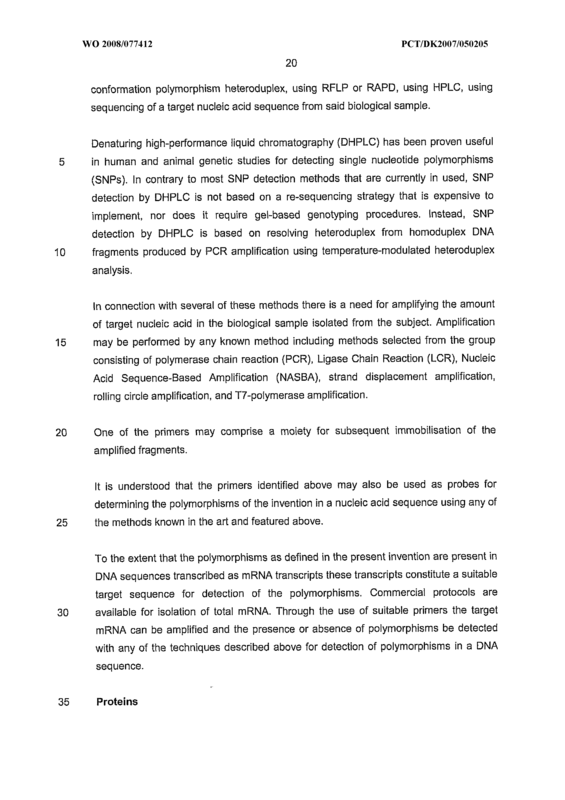 The method according to any of the preceding claims, further comprising determination of at least one polymorphism is determined in a gene selected from genes of the complement system or in a chromosome region containing said gene. 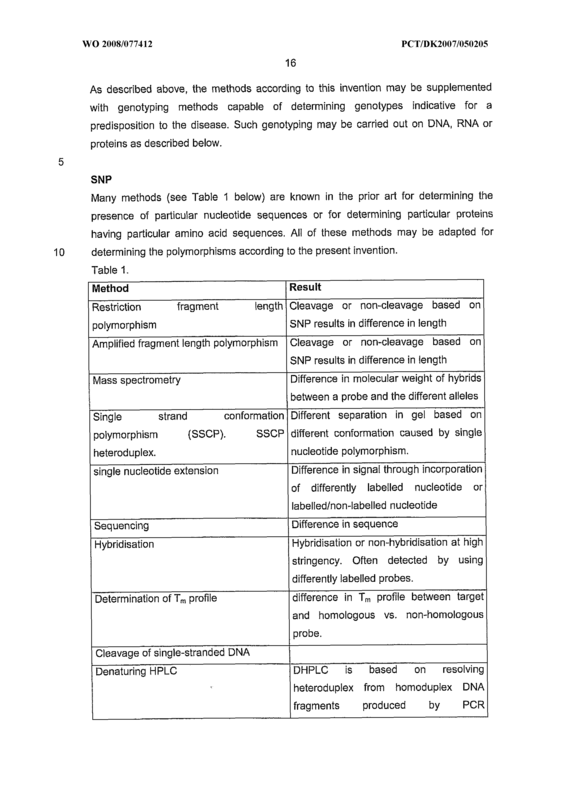 The method according to claim 13, wherein the at least one polymorphism is determined in a gene selected from complement factor H gene, LOC387715 gene, factor B gene and/or complement component 2 gene or chromosome regions containing said genes. 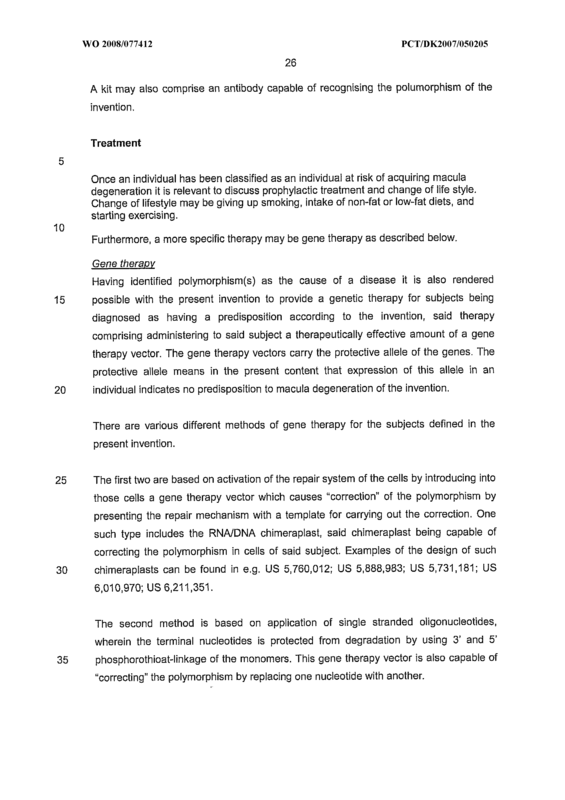 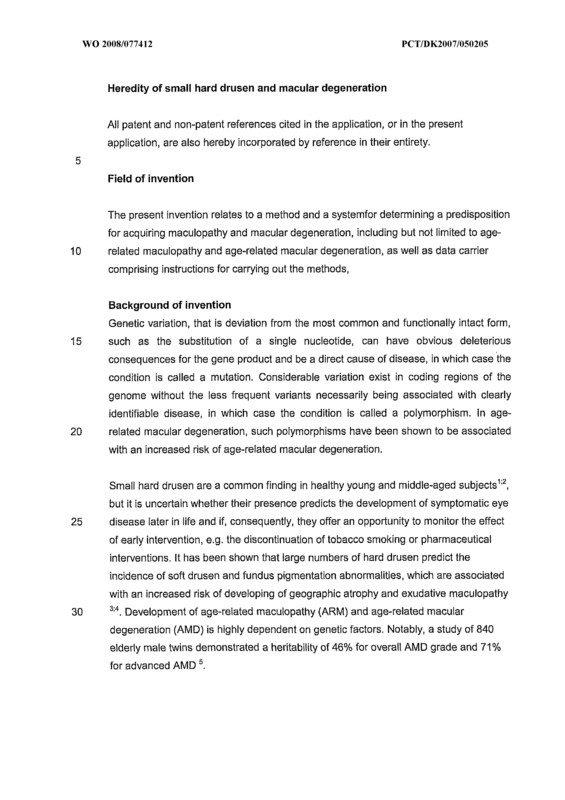 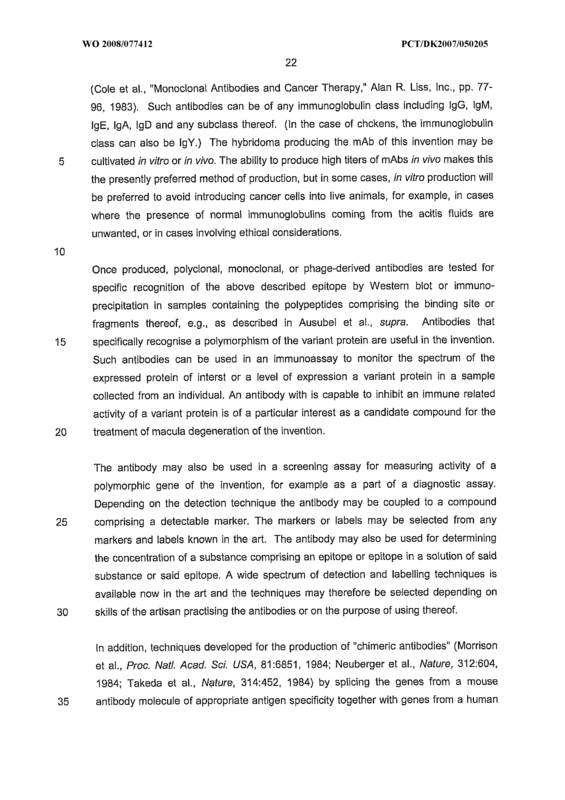 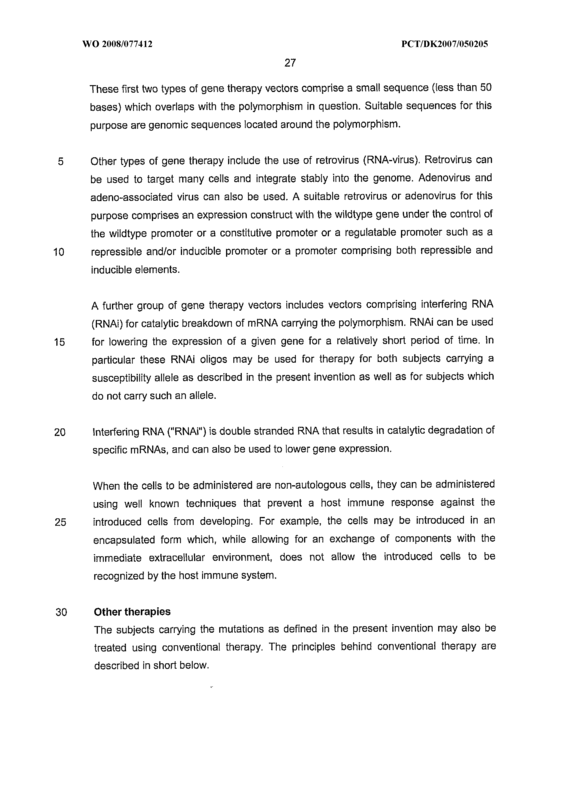 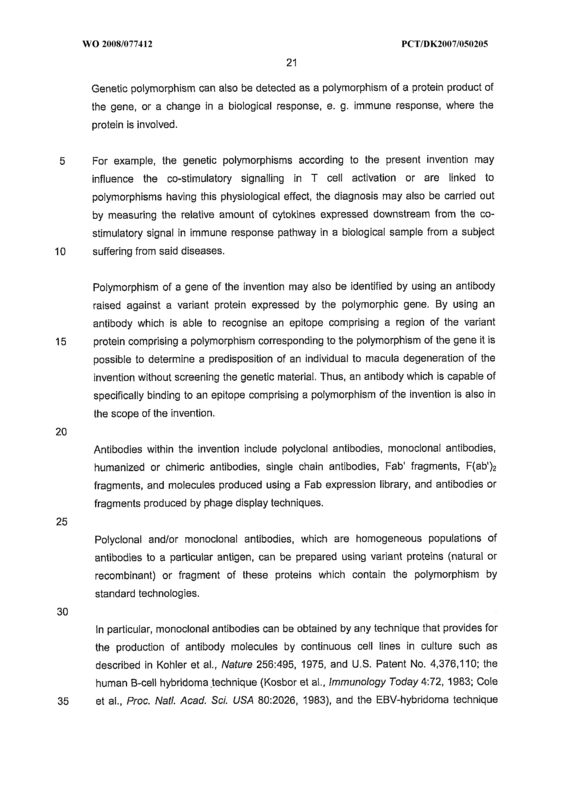 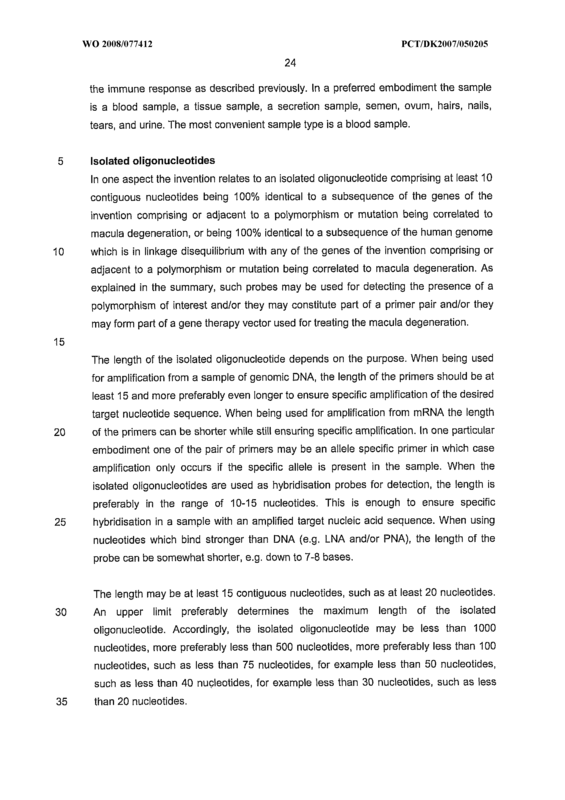 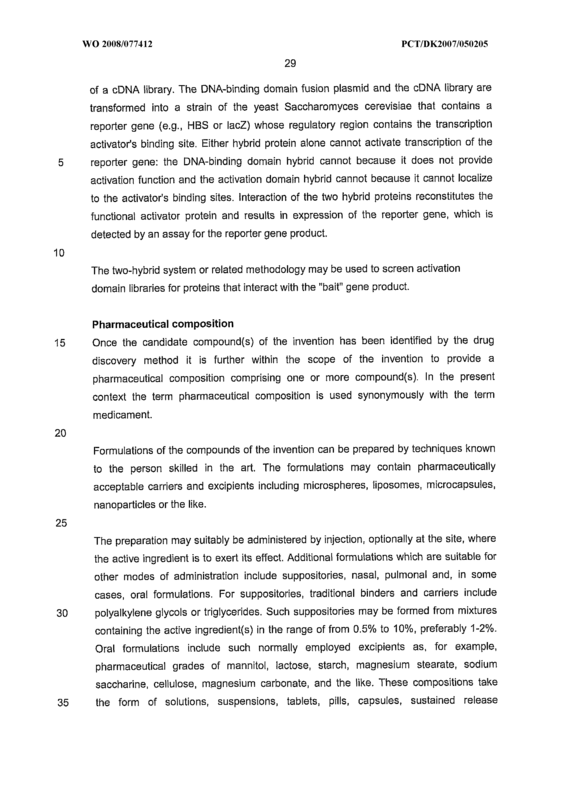 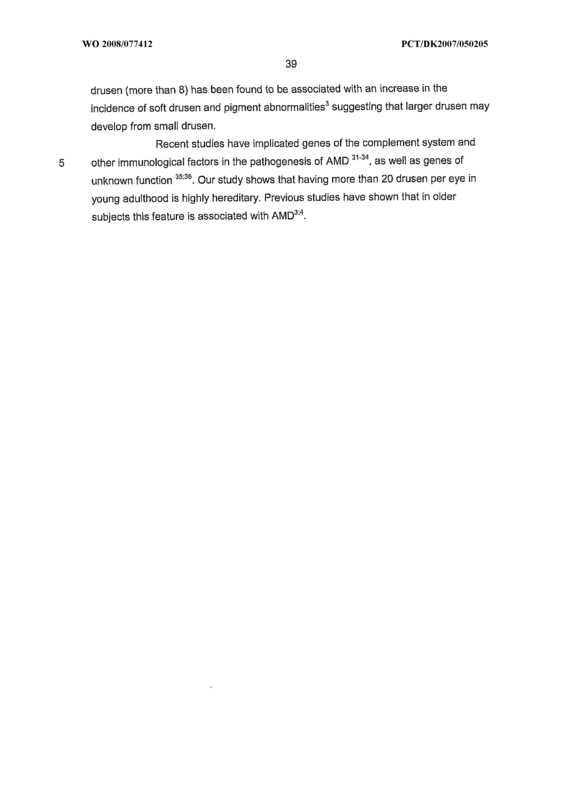 The method according to claims 13 to 4, wherein at least one of the polymorphisms is determined in a non-coding region of a gene such as an intron or in a region controlling expression of the gene. 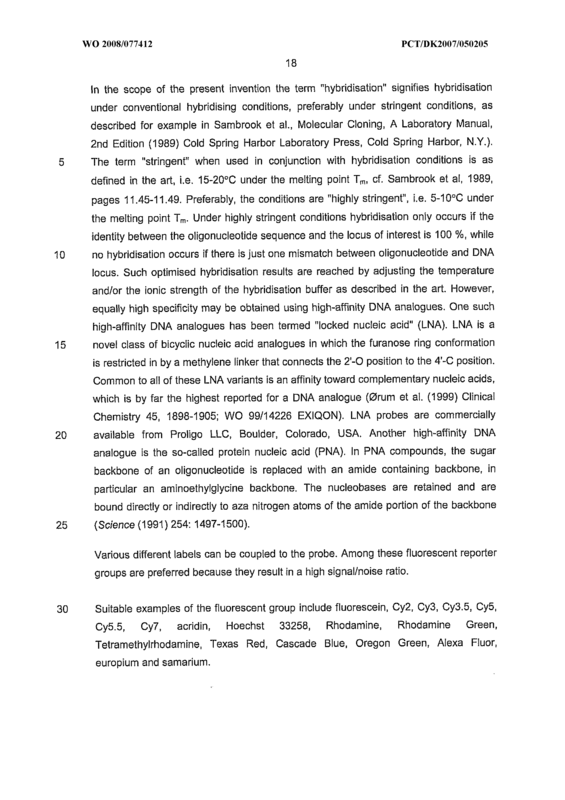 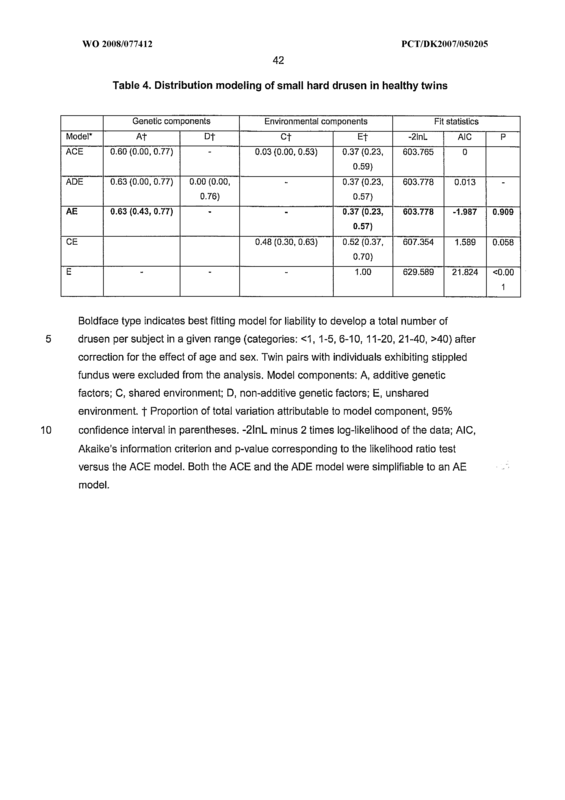 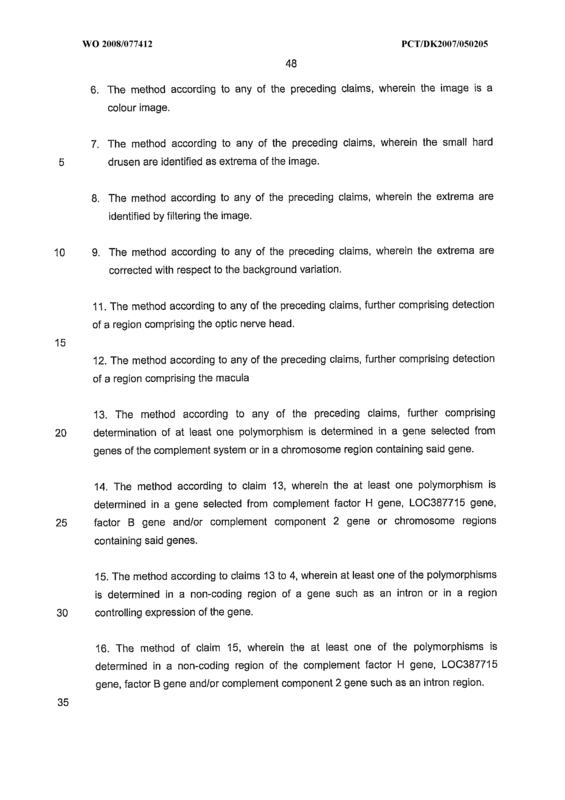 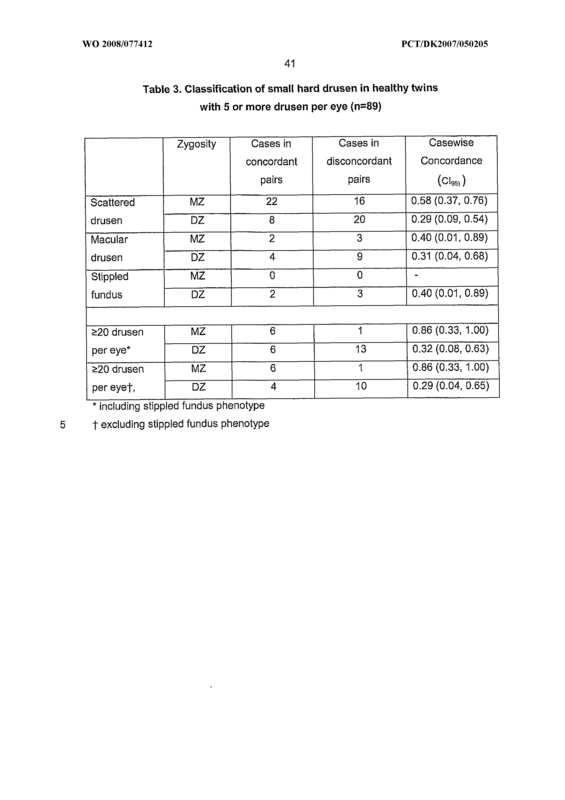 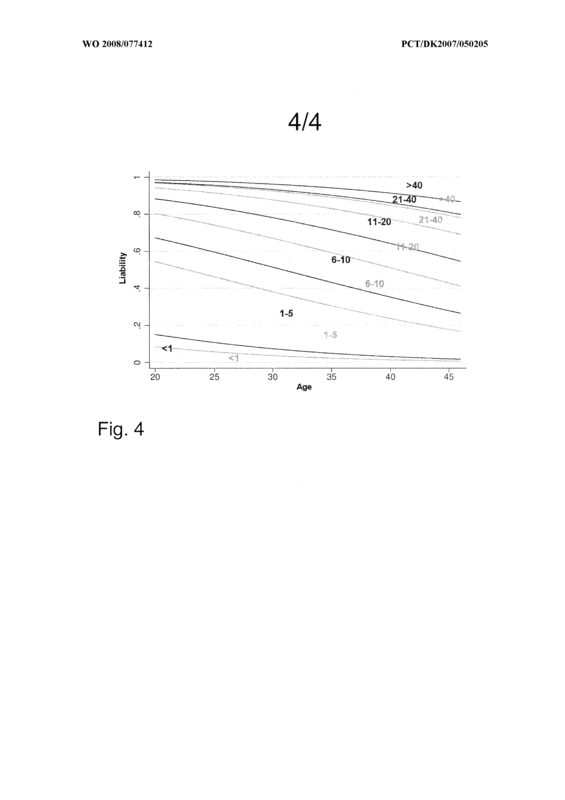 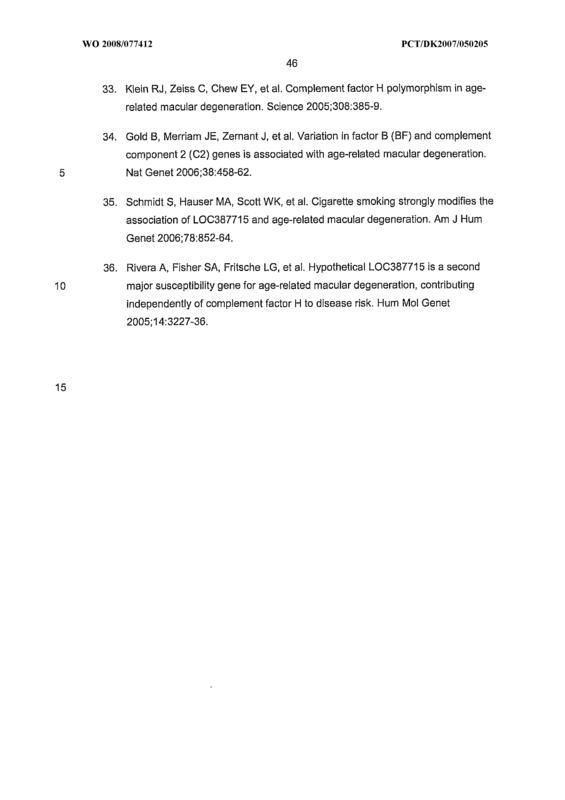 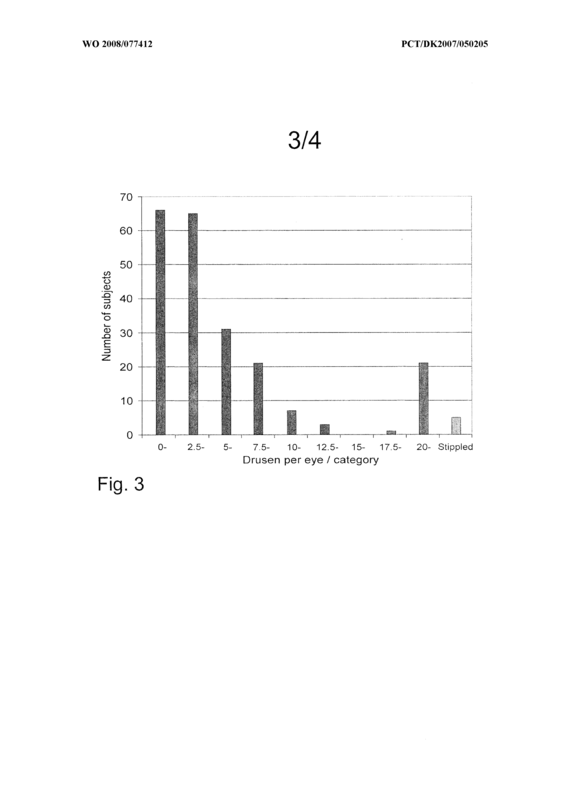 The method of claim 15, wherein the at least one of the polymorphisms is determined in a non-coding region of the complement factor H gene, LOC387715 gene, factor B gene and/pr complement component 2 gene such as an intron region. 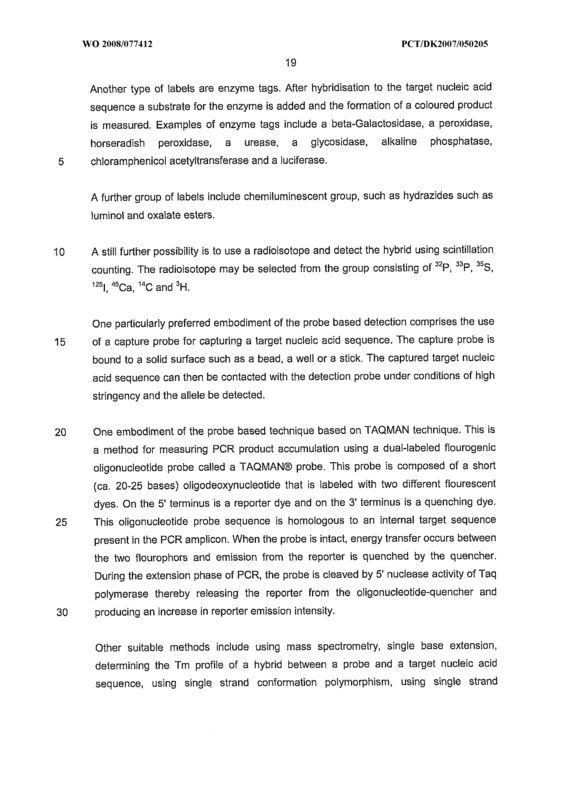 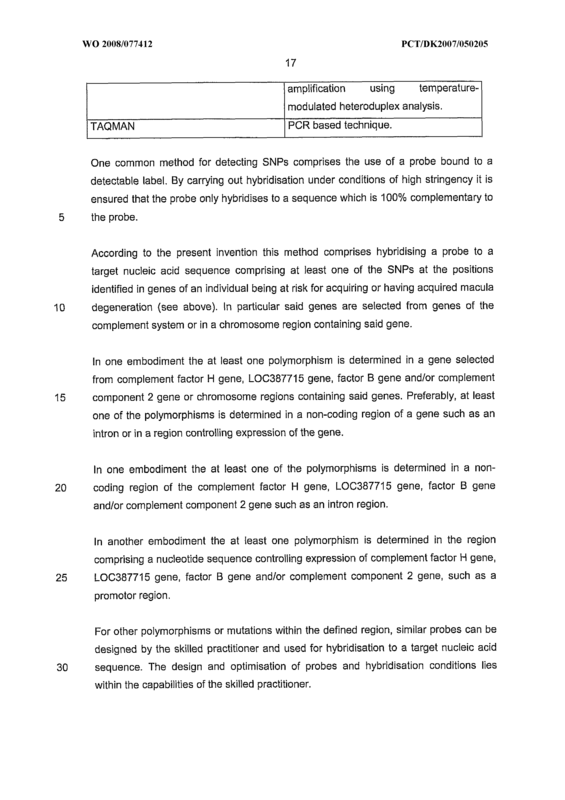 The method of claim 15, wherein the at least one polymorphism is determined in the region comprising a nucleotide sequence controliing expression of complement factor H gene, LOC387715 gene, factor B gene and/or complement component 2 gene, such as a promotor region. 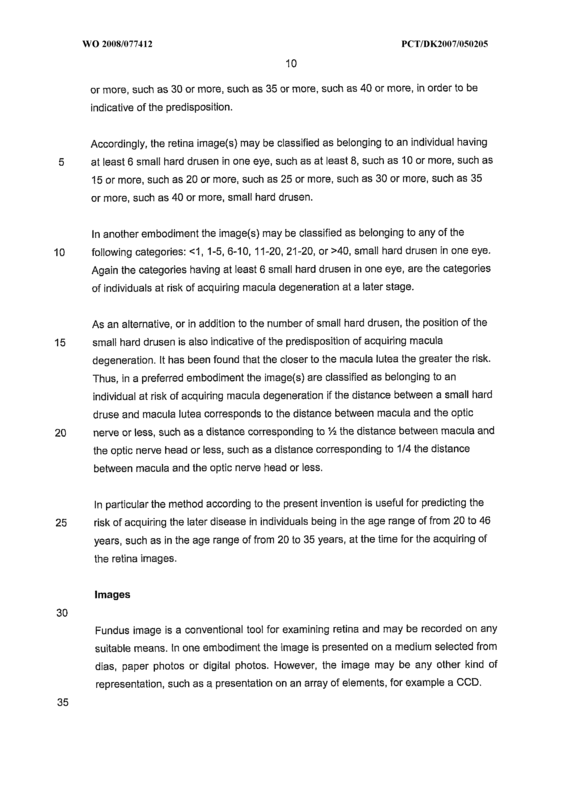 classifying the fundus image into at least two classes, wherein above 6 small hard drusen areas in at least one eye, and/or a position of smali hard drusen within a predetermined distance to the macula leads to classification of said image as a an image of an individual at risk for acquiring macula degeneration at a later stage in life. 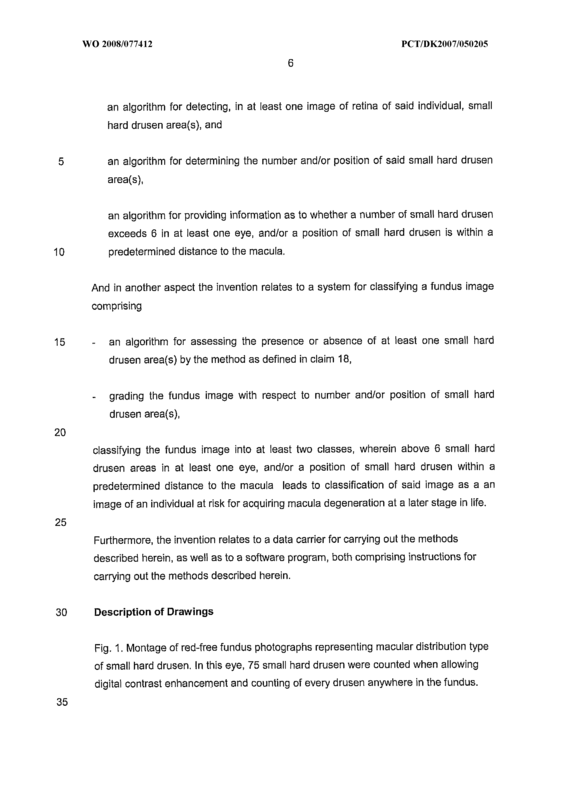 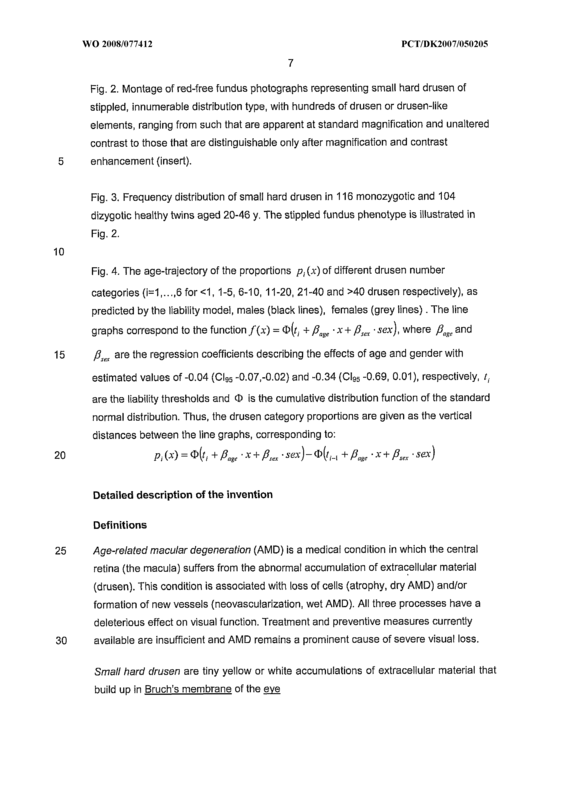 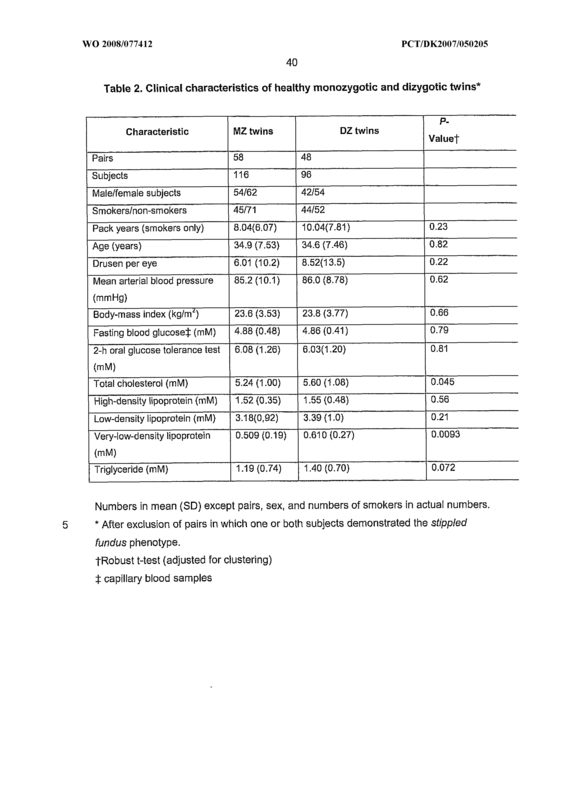 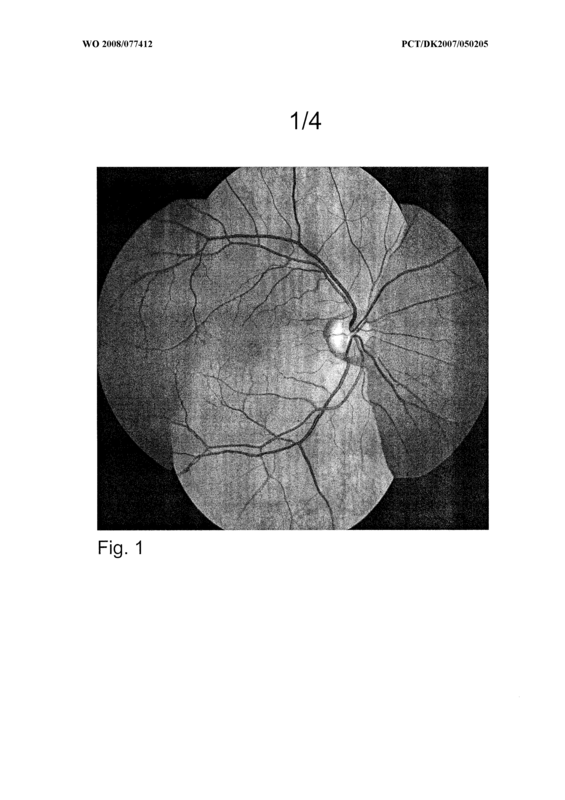 an algorithm for providing information as to whether a number of small hard drusen exceeds 6 in at least one eye, and/or a position of small hard drusen is within a predetermined distance to the macula. 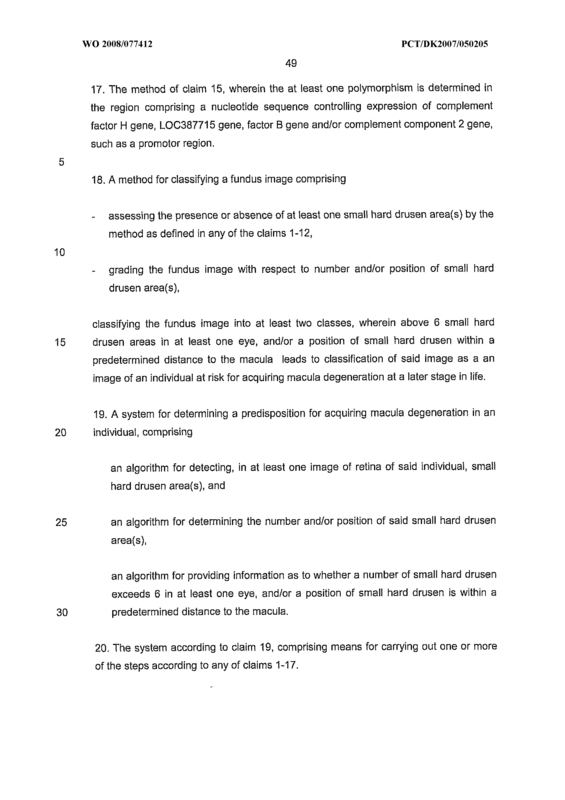 The system according to claim 19, comprising means for carrying out one or more of the steps according to any of claims 1-17. 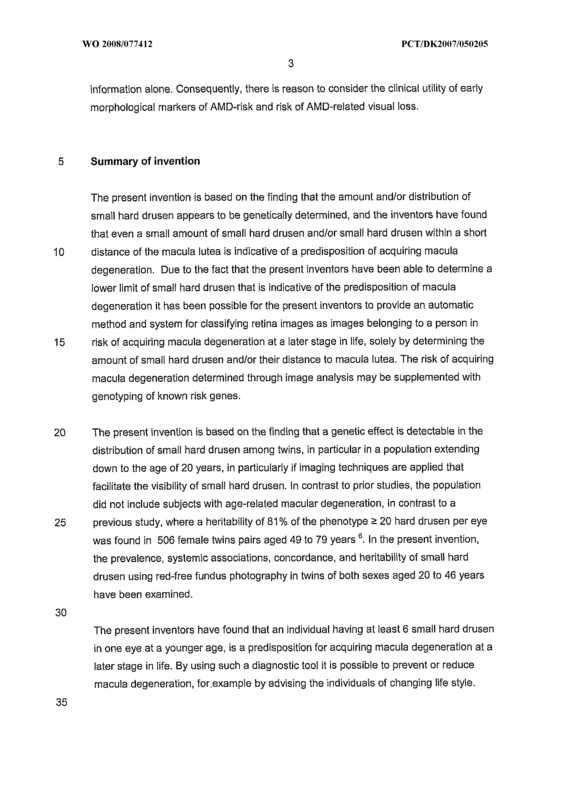 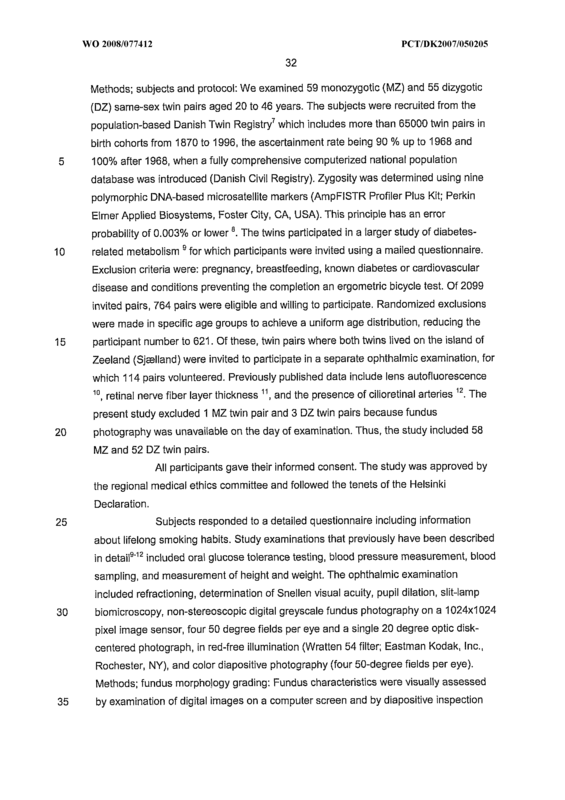 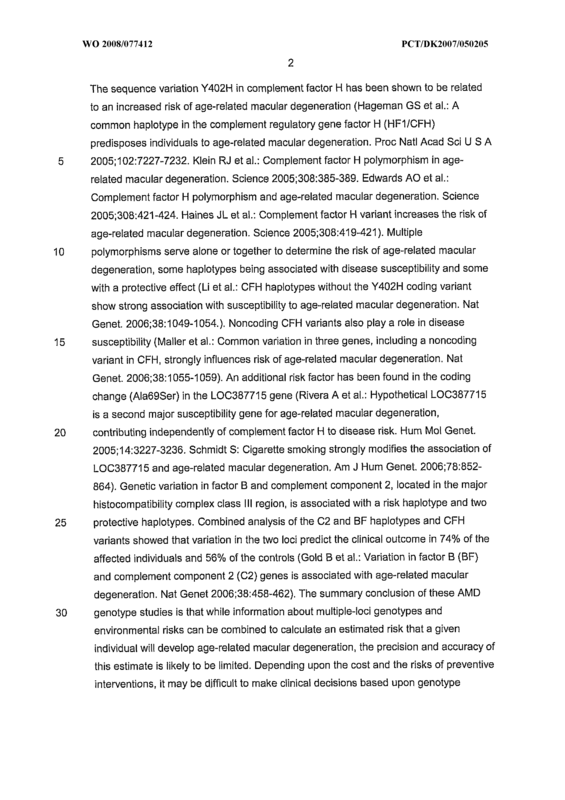 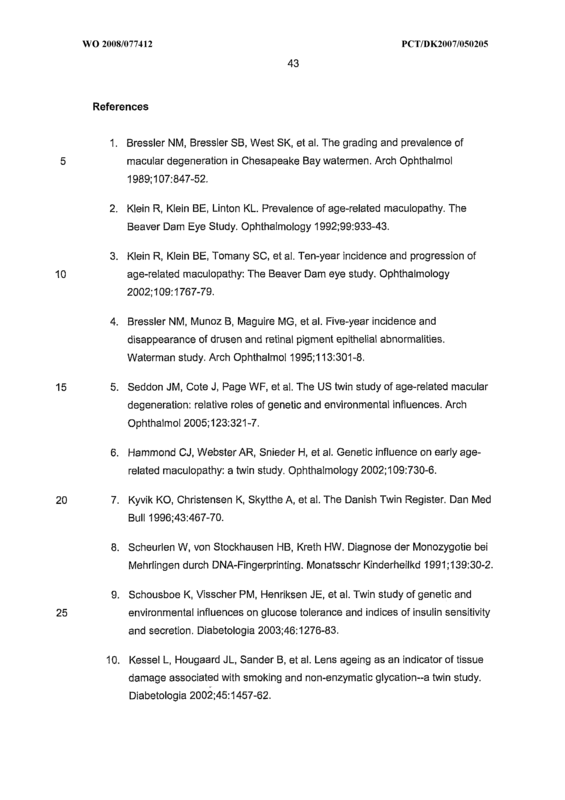 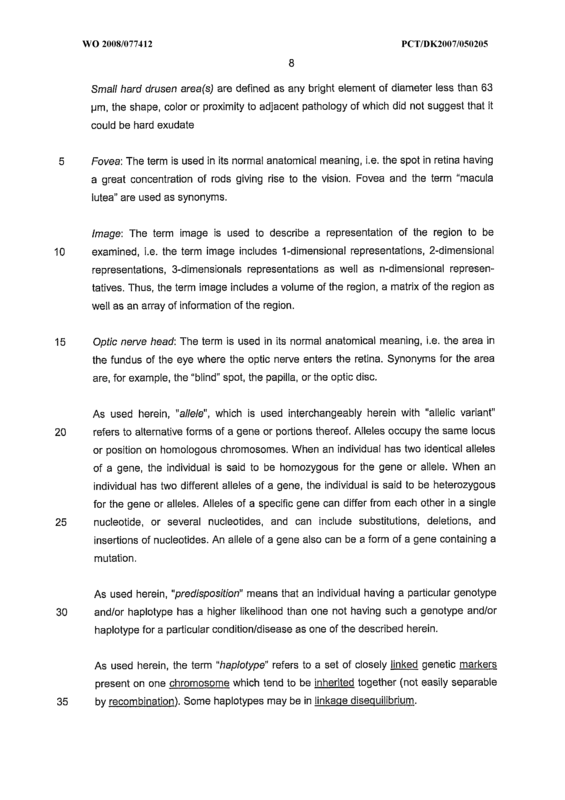 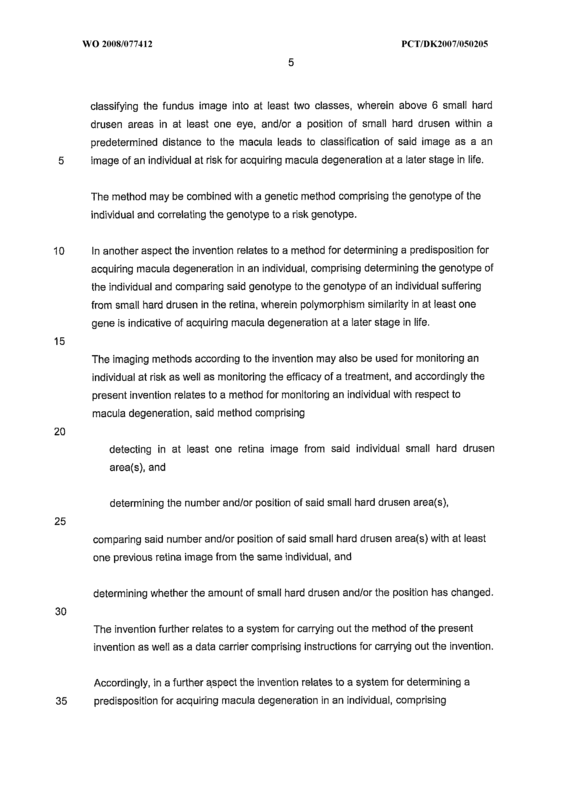 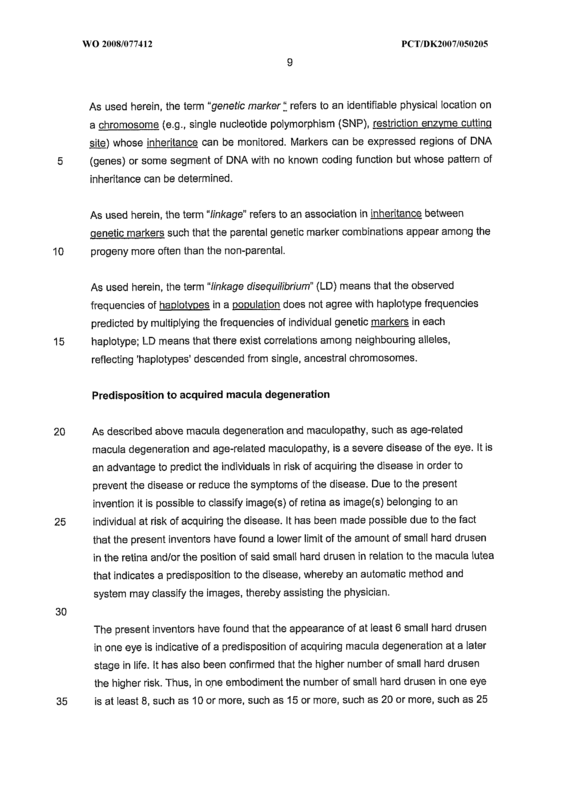 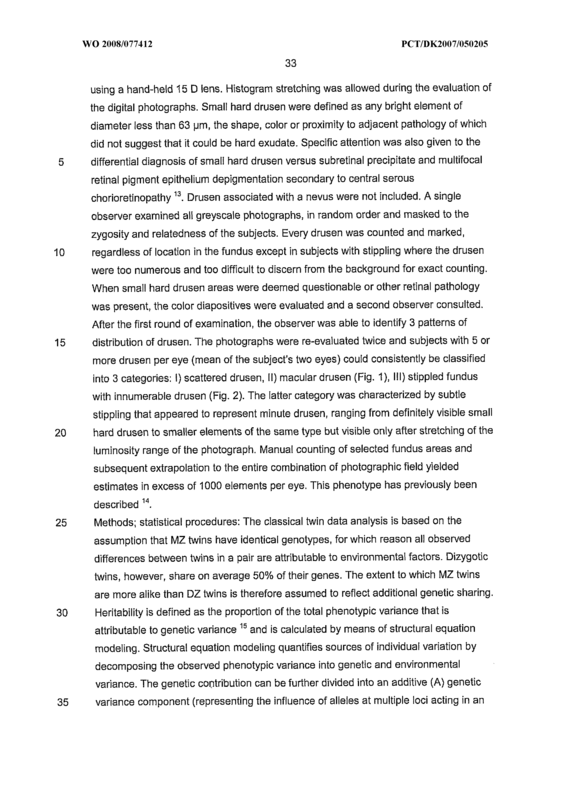 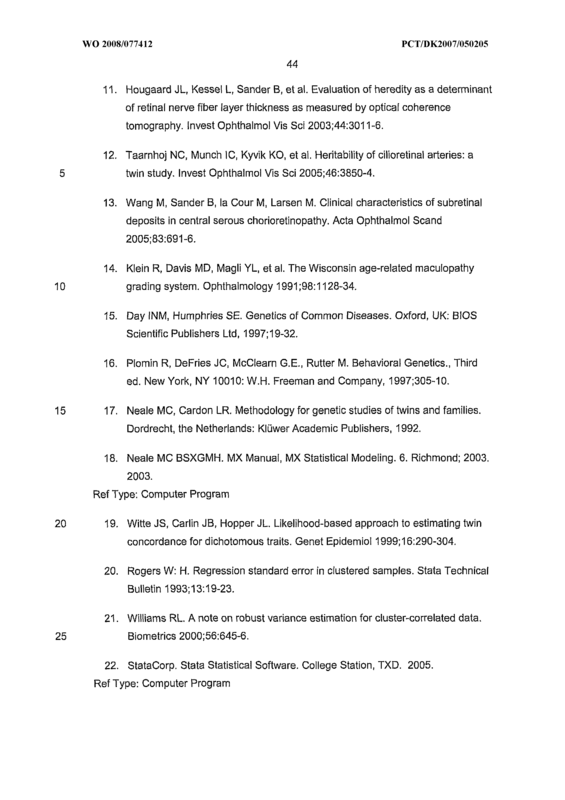 The system according to claim 21 , wherein the information is result of a genotype test as defined by any of the claims 13-17.
classifying the fundus image into at least two classes, wherein above 6 small hard drusen areas in at least one eye, and/or a position of small hard drusen within a predetermined distance to the macula leads to classification of said image as a an image of an individual at risk for acquiring macula degeneration at a later stage in life. 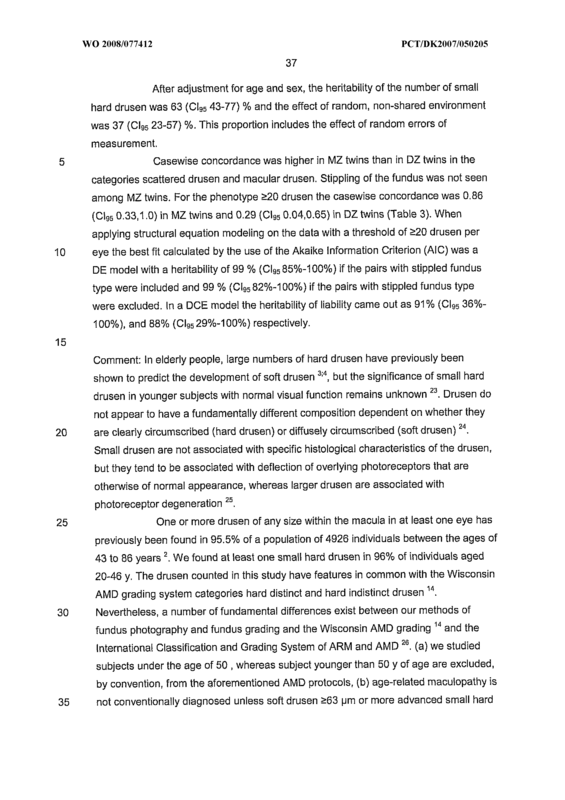 determining whether the amount of small hard drusen and/or the position has changed. 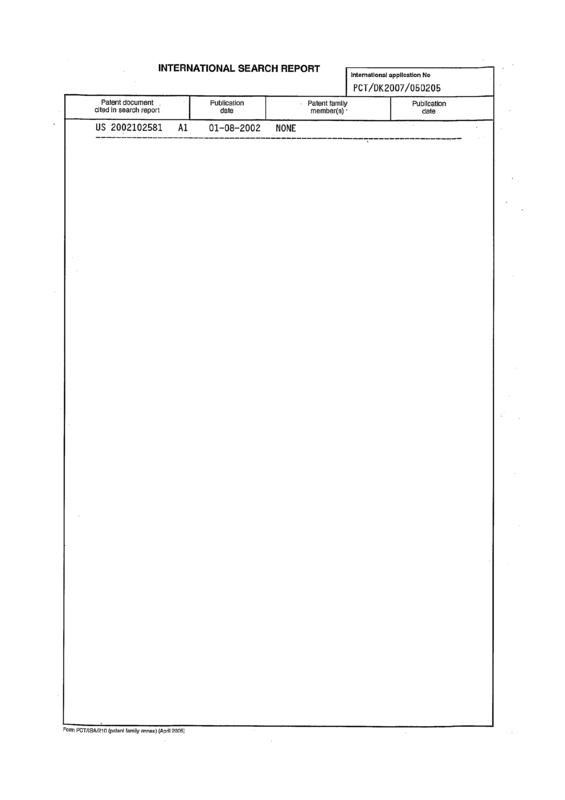 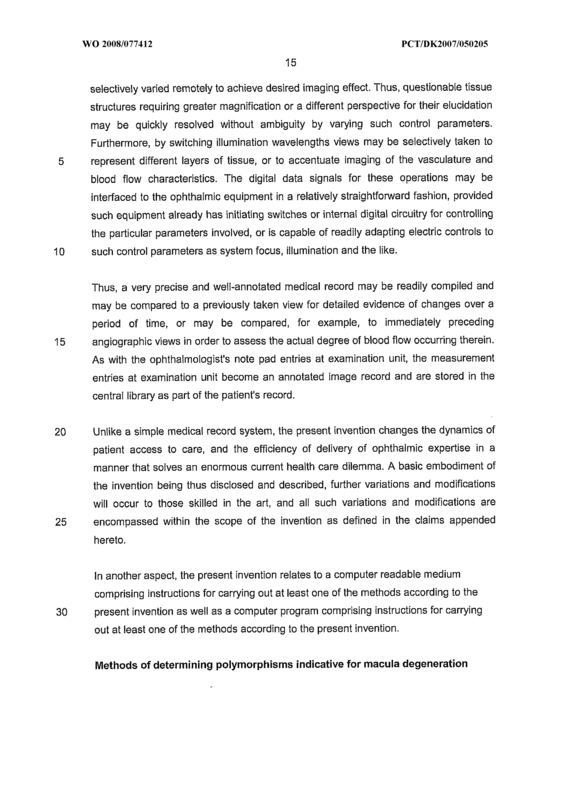 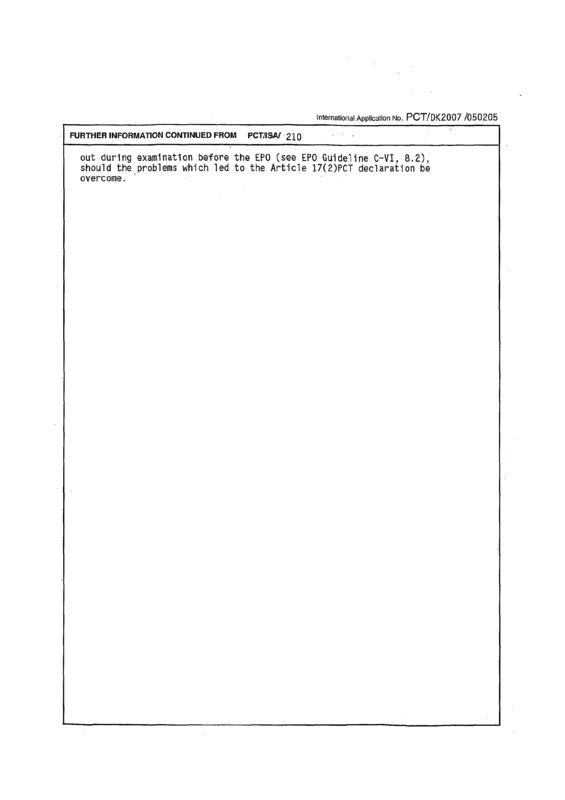 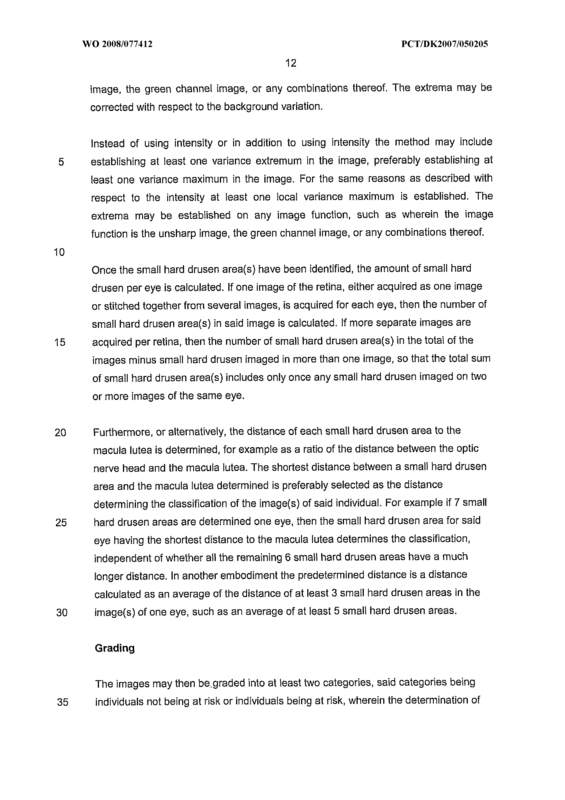 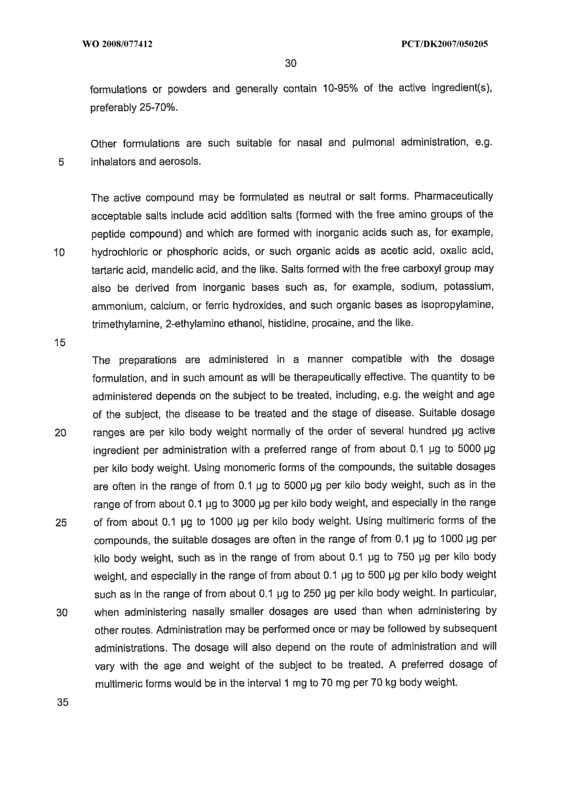 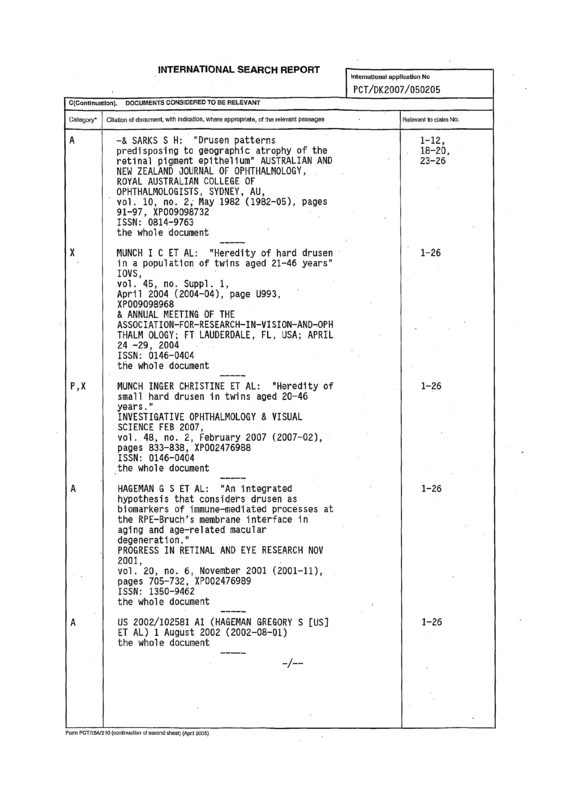 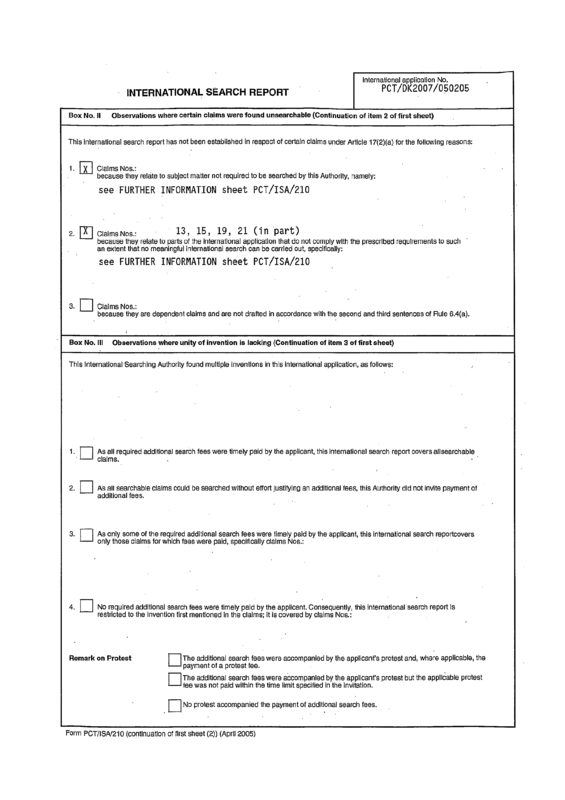 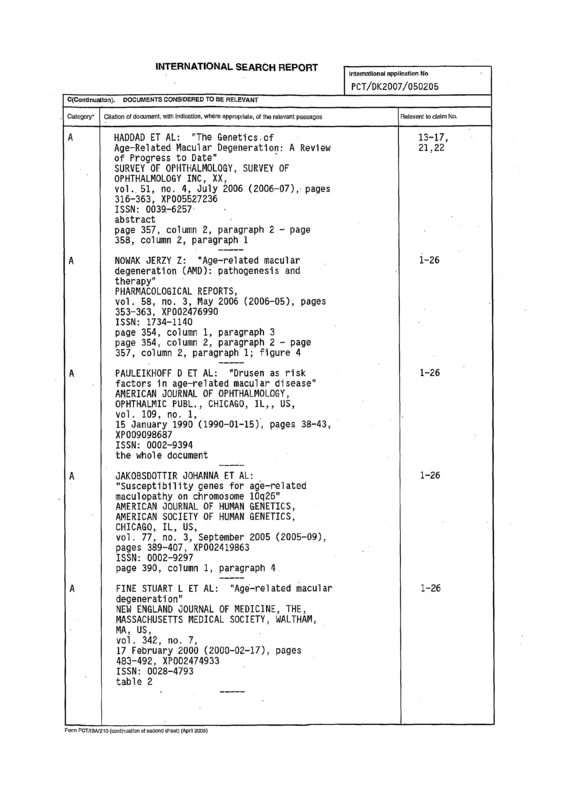 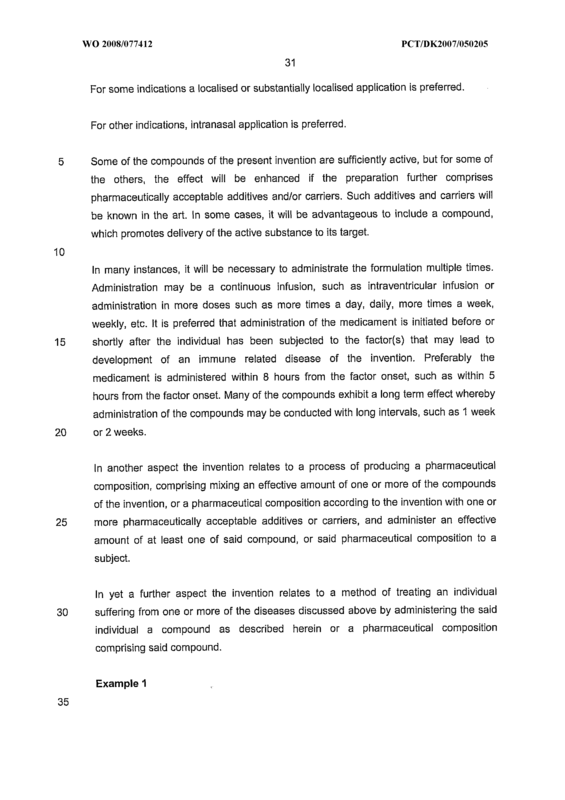 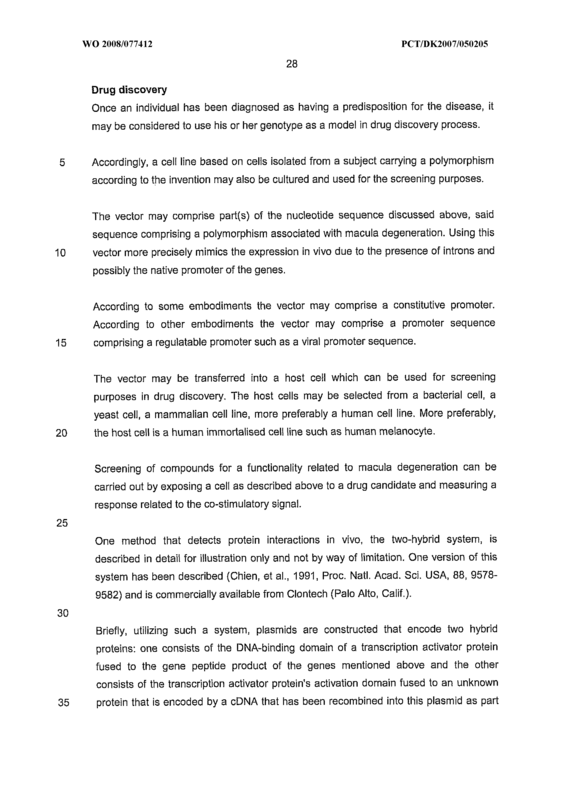 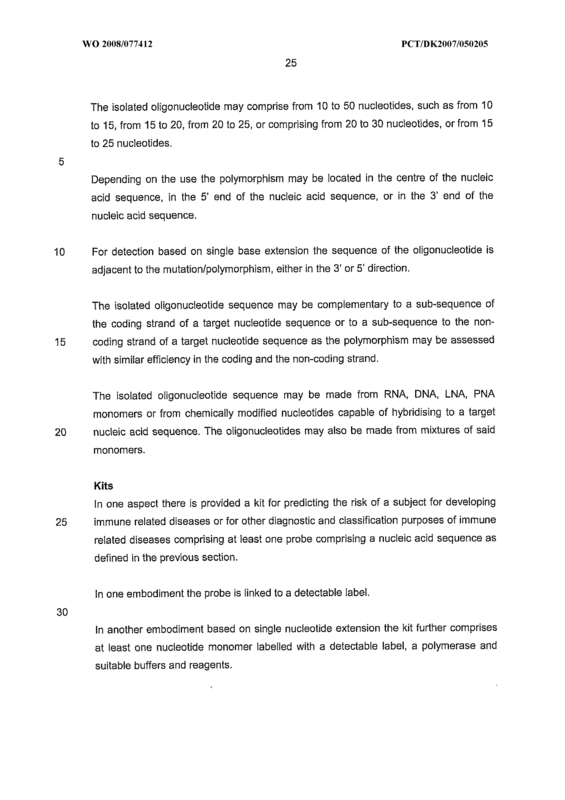 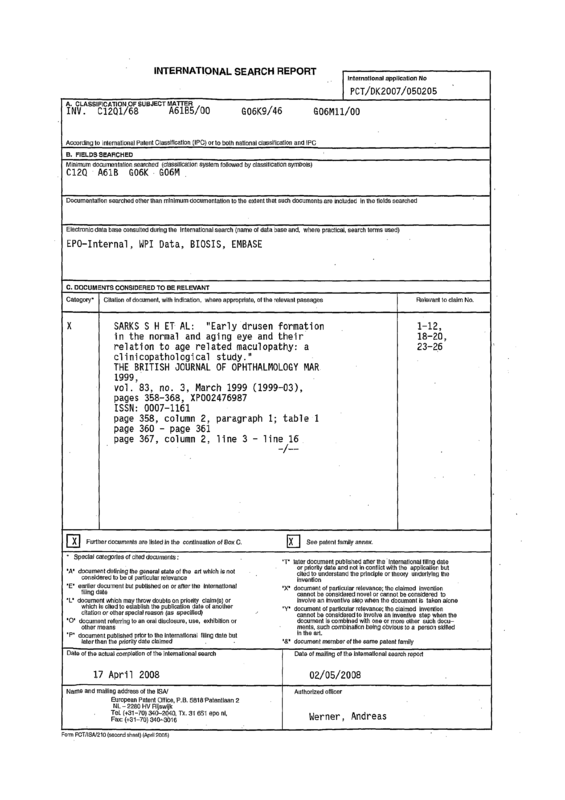 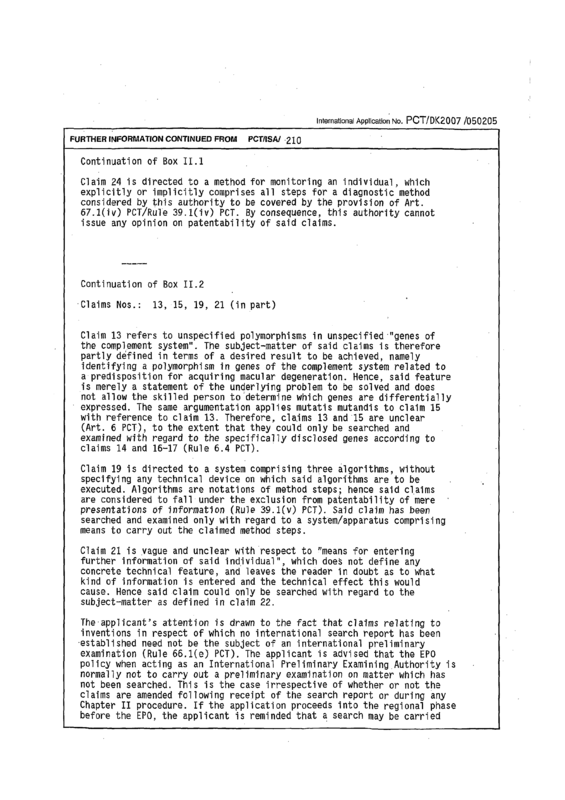 A computer readable medium comprising instructions for carrying out the method according to any of the preceding claims 1-18 or 24. 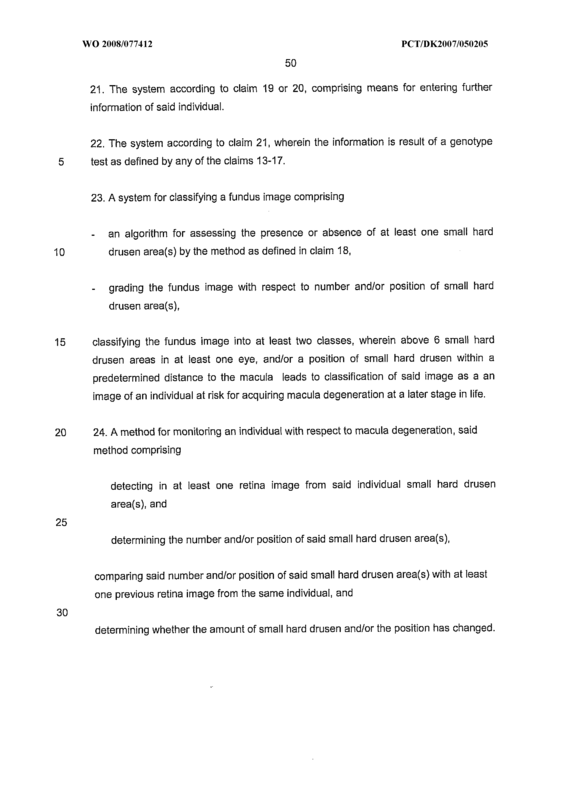 A software program comprising instructions for carrying out the method according to any of the preceding claims 1 -18 or 24.